The World Meteorological Organization (WMO) has said that its new landmark report on climate change should act as a wake-up call about the huge challenges and benefits of limiting global warming to 1.5°C in view of the escalating threats from rising temperatures. 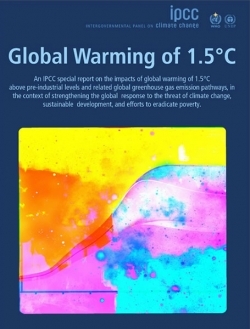 The Intergovernmental Panel on Climate Change (IPCC) Special Report on Global Warming of 1.5°C demonstrated how keeping temperature increases below 2°C would reduce the risks to human well-being, ecosystems and sustainable development. However, the report found that limiting warming to 1.5ºC would require an unprecedented response, and that net carbon dioxide emissions must be reduced to zero by 2050 to do so. At the current rate of emissions, the world will reach 1.5°C warming between 2030 and 2052. WMO and the UN Environment Programme co-sponsor the Nobel-prize winning IPCC, which was asked to prepare the report when governments adopted the Paris Agreement to combat climate change. The Paris Agreement sets a long-term goal of holding the increase in the global average temperature to well below 2°C above pre-industrial levels and pursuing efforts to limit the temperature increase to 1.5°C. The report highlighted a number of impacts that could be limited by lower temperature increases. For instance, by 2100, global sea level rise may be 26cm to 77cm higher than the 1986-2005 baseline under a 1.5°C temperature increase, or about 10cm lower than for a global warming of 2°C. This would mean that up to 10 million fewer people would be exposed to related impacts such as saltwater intrusion, flooding and damage to infrastructure. Limiting global warming would limit the increases in ocean temperature and acidity and decreases in ocean oxygen levels and so would reduce risks to marine biodiversity, fisheries and ecosystems. But even with a temperature increase of 1.5°C, coral reefs are expected to decline by 70-90%, whereas more than 99% would be lost with 2ºC. The report finds global emissions of CO2 should decline by about 45% from 2010 levels by 2030 (SPM15C1).The report said that net zero emissions of carbon dioxide must be reached by 2050. This means that any remaining emissions would need to be balanced by removing CO2 from the atmosphere. The effectiveness of such techniques is unproven at large scale and some may carry significant risks for sustainable development. Prof. Pavel Kabat, chief scientist, WMO, said, “This report is a further incentive for WMO to intensify its scientific support for climate change mitigation and adaptation through a new strategy entailing fully integrated, “seamless” Earth-system approach to weather, climate and water domains.